But it’s still more expensive than the outgoing Corolla IM. Following its , Toyota has announced pricing and economy details for the , confirming that it will be more expensive than the outgoing Corolla iM. The base SE model will set you back $19,990 with a manual transmission excluding the $920 delivery and handling cost, making it $1,000 more expensive than the cheapest Corolla IM and around the same as a Honda Civic hatchback with a manual. Economy figures have seen a slight improvement at 28 mpg city, 37 highway and 31 combined. Opting for a continuously variable transmission in the SE trim will cost $21,090 with 32/42/36 mpg city/highway/combined. The sportier XSE trim has an MSRP of $22,990, with fuel economy figures still to be confirmed. The CVT version of the XSE model costs $24,090 and delivers 30/38/33 mpg city/highway/combined. For an extra $415, the XSE model can also be equipped with an innovative Adaptive Front Lighting system that focuses light distribution in an area that matches the car’s speed and steering angle. For the SE model, the optional Preferred Package includes Toyota’s Entune 3.0 infotainment system with Toyota Connected services and a blind spot monitor. Available for an extra $1,600, the XSE preferred package also includes a JBL eight-speaker 800-watt sound system, dynamic navigation and QI-compatible wireless charging. A premium Blizzard Pearl paint finish is also available for both models for $395. Both models feature LED headlights and taillights, a chrome rear diffuser, and alloy wheels. The sportier XSE trim comes with 18-inch wheels, LED fog lights and a chrome grille surround. 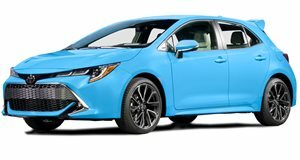 In terms of powertrains for the 2019 Toyota Corolla Hatchback, your only option is 2.0-liter direct-injection inline four-cylinder engine, which can be paired with either a CVT or six-speed manual transmission.